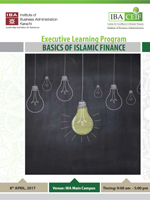 IBA Centre for Excellence in Islamic Finance is pleased to offer a one-day introductory level course to provide intensive understanding of Islamic Finance & Banking concepts, background and related Shariah principles governing Islamic Finance. The participants will develop an understanding of the modes of Islamic Finance and how they are applicable in modern day financial system. The course aims to provide a rich learning experience to the participants, which will equip hem with the required skills to explore the growing field of Islamic Banking & Finance.